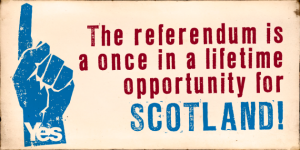 Very thorough and personal reflection on the Referendum campaign. I don’t agree with all of his points, but it is well worth reading and reflecting on for the future. Before starting I’d like you to look at the above image. No one knows exactly what reality really is. Is it possible we’ve come the closest we’ll ever come in our lifetimes to an independent Scotland? Can we go further? This article is premised on the assumption that there are still opportunities to gain independence for Scotland, if we learn from where I believe we went wrong. Nova Scotia – a model for Devo Max ? With independence off the table for the medium term future,Yes supporters need to turn our attention to Devo Max. This is where the real battleground will lie in the short term – up to and possibly beyond the 2015 UK general election. The Unionists made solemn vows that a No vote would lead to greater powers for the Scottish Parliament. Some even talked about Home Rule and a Federal Britain. We must hold them to account on this. However we must do more than just sit back and wait for the UK government to come up with something. This would be a great mistake. Whatever Westminster comes up with, however little and insignificant it amounts to, they and their friends in the media will present it as wonderful, powerful and unprecedented. If we are to counter this we cannot wait and then complain. We need to get in our counter proposals now. The key here is that it is the No voters that the Unionists need to convince with their offer. We still want independence but we are, let us not forget, the minority, so our views are of little import to the UK government. We need to get out into the public domain examples of what devolution of real powers looks like. This way all of us, including No voters will have a meaningful marker against which to judge the UK government’s offer. There are many possibilities for Devo Max all the way to full fiscal autonomy. But as long as they remain theoretical, academic options, they are not likely to capture the interest or the imagination of the general public. Especially No voters. Instead I suggest that we put forward real life examples from other countries. I would propose the Canadian system as a good example to recommend. I have chosen Nova Scotia to illustrate this for obvious reasons, though the basics apply to all Canadian provinces. This has the advantage that most people in Scotland and the rest of the UK will be pretty familiar with Canada. Not the details of course, but Canada as a friendly, successful and stable country. One that used to be part of the British Empire to boot. This makes it that bit harder for Unionists to reject outright the Canadian system. If it works for Nova Scotia and for Canada why not for Scotland and the UK? What powers does Nova Scotia have? Very substantial powers is the short answer. The following brief summary is taken from the Nova Scotia Finance and Treasury Board. You can access the page here. Basically Nova Scotia raises revenues from; income tax, corporate tax, sales tax, taxes on petrol, user fees and royalties from offshore petroleum production activities. In the case of income tax, corporate tax and sales tax, both the federal and provincial government set their own rates. The Harmonized Sales Tax for example in Nova Scotia is 15% – a federal portion (5%) and a provincial portion (10%). It is also interesting to note that most taxes in Nova Scotia are collected and administered by the Canada Revenue Agency. So there is no need for unnecessary duplication of beaurocracy. Just to be clear, we do not need to become advocates for any particular form of devolution. But I do believe that we need to do all we can to ensure that the wider public is aware of how extensive devolution is in other successful countries. Canada is just one example. It does have a nice ring to it though. Why should Scotland not have the same economic powers as Nova Scotia? Why do they want us to stay? It is always a wonderful sight to behold – the British establishment in one of its periodic bouts of panic. And none surely come greater than the current one. The sight of Messrs Cameron, Clegg and Milliband downing tools at Westminster to hurry north, separately, mind you, to save the union is one that will become a classic. A couple of opinion polls show the referendum on a a knife’s edge and all hell breaks loose in London. Panic stations does not do justice to the disarray among our Unionist friends. Promises and timetables appear all over the place, as if this was a referendum on a new railway system. On even a cursory glance these so called promises turn out to be nothing more than cauld kale. Though journalists in London seem prepared to take it all at face value. Which just confirms how out of touch they are with developments in Scotland. The only really interesting question is why? Why is the British establishment so determined to keep Scotland in the UK? They say they love us, but the reality of the No campaign gives the lie to this claim. The one constant message from Unionists is that an independent Scotland would quickly become a basket case. Kicked out of the EU, denied NATO membership, oil revenues soon to disappear, without a currency and armed guards on the border. According to Better Together it is only the goodwill and financial subsidies from England which keep Scotland afloat. Yet they are so, so desperate for us to stay. It does not make any sense. Simon Heffer has a wonderfully vitriolic anti Scottish rant in the English edition of the Daily Mail. In it he pulls no punches in his disdain towards Scotland, and quite openly calls for us to shove off. In its Scottish edition the Mail’s headline is Cameron’s plea for us to stay. You could hardly make it up. The schozofrenia at the Mail is just the most visible sign of the dilemma which is destroying the No campaign. Is Scotland a burden or an asset? Simon Heffer’s fact free rant is squarely based on the subsidy Jock theory of “the most successful union in history”. He even manages to come up with a figure for this. Apparently we Scots get subsidised to the tune of nearly £18 bn per year by our oh so generous friends in England. I guess it is just England which provides this largesse, as I doubt even Simon Heffer believes that the Welsh and the Northern Irish generate this kind of surplus. However even if we dismiss Mr Heffer as a bit of a buffoon, the official No campaign is happy a to peddle this notion that Scotland is subsidised by England. How else can we explain their constant refrain that an independent Scotland would face a gaping hole of £6bn In our budget? Presumably we only survive at the moment due to the English kindly picking up this tab. So once again we have this conundrum – if we are a burden to England, why are its leaders so determined to keep us? £6bn per year is a tidy sum, even for rUK. It will in practice be even higher. According to the No campaign when Scotland becomes independent we will lose many of our largest companies,including the banks and other financial services providers. They will relocate to rUK, thus providing another tidy boost to the economy of rUK. Furthermore we have recently been assured that independence will result in a massive capital flight out of Scotland, again to the benefit of rUK. All of the above is the ongoing message from the No campaign. Scotland is too poor to survive on its own and needs the rUK, read England, to pay for all our goodies. Yet here we have three Englishmen touring Scotland and pleading desperately for us to stay in the UK. Have they told their English constituents that Scotland is apparently costing them tens of billions of pounds every year? Would the good people of England not prefer to keep these billions for themselves to spend on their NHS, rather than subsidising us Jocks? They cannot love us that much and they cannot all have a Scottish granny living somewhere in the Highlands. Though some of them probably do own a fair chunk of our land. Perhaps, just perhaps, there is something more at stake for the British establishment. This is an establishment not known for its magnanimity when it feels its power is under threat. The kind of panic we are witnessing today does not come out of love. It comes out of fear. Will our three gallant musketeers dare to tell us and the people in rUK what their fears are? Is Scotland, far from a subsidy junkie, a net contributor to the UK? Far from running out, are we facing the prospect of an another oil boom, with massive revenues to come for decades ahead? Revenues that the UK cannot do without? Not to mention that a rUK much diminished in size might find it impossible to maintain its great power illusions. In particular its prized permanent seat in the UN Security Council. All in all it may be that it is rUK that has most to lose as a result of Scottish independence. But will our three front men for the British establishment dare to tell us the truth?